BUY CATAVINO’S PORT LODGE MAP! Over a decade ago, Ryan and I travelled to Portugal with a passionate desire to explore its culture and its wines. Having started in Lisbon, lapping up an “exotic” new perspective, we headed north to one of the most picturesque cities in the the world, Porto. With its multifaceted textures and rich history, Porto left us a reeling in wonder, in anticipation, in excitement; that is until we looked across the Douro River to Vila Nova de Gaia. Vila Nova de Gaia is a separate municipality from Porto, despite its close proximity across the famed Dom Luis bridge. Clambering up the steep riverbank, we encountered dozens of Port lodges vying for the attention of wine geeks and neophytes alike. The problem being, we were clueless as to which one to visit. Unable to find even a passable map to guide us through the winding cobblestone streets, we kept to the beautiful promenade lined with the traditional barcos rabelo boats and knocked on as many doors as we could find. Often we would find a lodge entrance that was closed to visitors; or we would need to retrace our steps down the steep embankment having meandered into a dead-end street, which only left us feeling more frustrated than we already were. With such an incredible shoreline to be discovered, why wasn’t there more information? Why wasn’t there a simple map to help us learn more about a fortified wine we love? Over a decade later, and several more trips to Porto, we were finally able to make this wish into a reality. Finally, the Catavino Port Lodge Map was born! In collaboration with the talented Portuguese artist, José Miguel Cardoso, this gorgeous, hand drawn map offers a comprehensive and entertaining way to discover the Port Lodges of Vila Nova de Gaia! We wanted a tool that wasn’t only practical, but so beautiful that you’ll hopefully store it away as a keepsake for years to come. Sitting on the Porto side of the river, we’ve created a map with two distinct perspectives: landscape and aerial. So, assuming you’re sitting at a riverside terrace in Porto, with a delicious libation in hand, the landscape perspective displays a mirrored version of what you’re seeing. What lies across the river is mimicked on the map infront of you. You can then use the aerial version to make your way across the river among the rabbit warren like roads to the exact location you’re looking for. In addition, we’ve added a short description of each lodge, and what to expect from a tour, including (but not restricted to): types of tours, languages offered, special workshops and wheelchair accessibility. In this way, you can choose the lodge(s) that meet your specific needs. For those foodies among you, we’ve even provided traditional foods and drinks to enjoy during your stay, not to mention places of interest on the Porto side of the river. With luck, this map will help you feel confident when staring across the river: a tool that is not only gorgeous to look at, but accurate and useful! Plus, it’s stamped with our “100% Fermentado em Portugal” brand. As this product is about Portugal, and its Port culture, we wanted to ensure we support the Portuguese economy. Hence, when you come to Porto, you’ll be giving back to the people that make it so special. If you’re interested in purchasing this map, simply send us an email for now, eventually we’ll have it in our store to buy online. 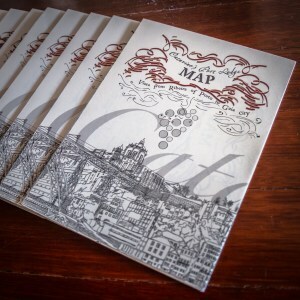 Buy Catavino’s Port Lodge Map in Portugal!